I recently purchased a Samsung Galaxy S4 from T-Mobile. I liked the fact that they have an unlocked boot loader and I am trying to cut down on my outrageous phone bill. One thing that was a requirement was that the device had to work with AT&T’s 4G & LTE bands in case T-Mobile didn’t have all of the coverage that AT&T did. 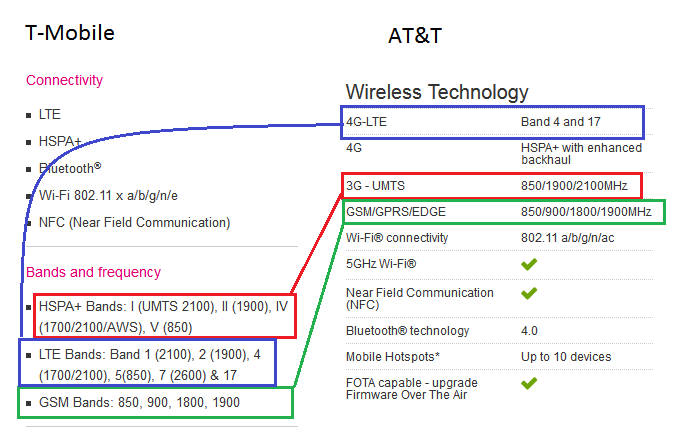 So I did a comparison of specs between AT&T and T-Mobile as shown below. Turns out they’re basically the same hardware. Sadly, T-Mobile’s coverage isn’t as good as AT&T’s is so I had to swap back in my AT&T SIM card. I can confirm from actual usage that AT&T’s service works GREAT on the T-Mobile Galaxy S4! I did have a bit of trouble getting the service to work entirely, AT&T wasn’t the most willing to help, so below are the APN settings you’ll need to get your phone working correctly. That’s it! Enjoy your T-Mobile Samsung Galaxy S4 on AT&T!